Love to be on the move. 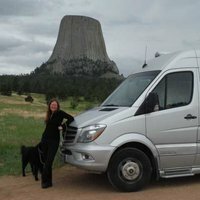 I got my RV in March of 2014. In the first year I put nearly 30,000 miles on, and I am still loving it! I love the idea of being able to travel and change my schedule without too much effort. And that if I find a great place to visit, I can take a detour and go there. I have also raised and milked goats, made goat milk soap, and am currently spending as much time as possible sailing my 48 foot sail boat in San Francisco Bay. I am always looking for new favorite places. 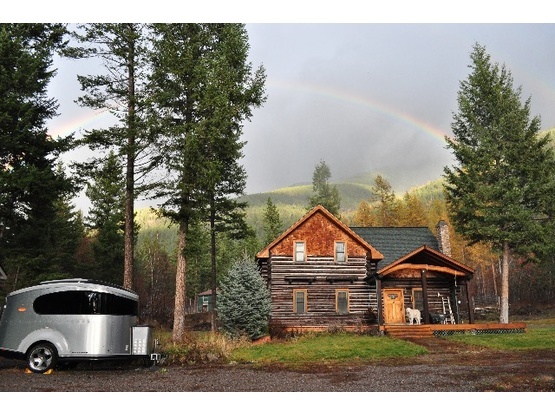 Right now my favorite for boondocking is a BLM site along the Columbia River near the Dalles. 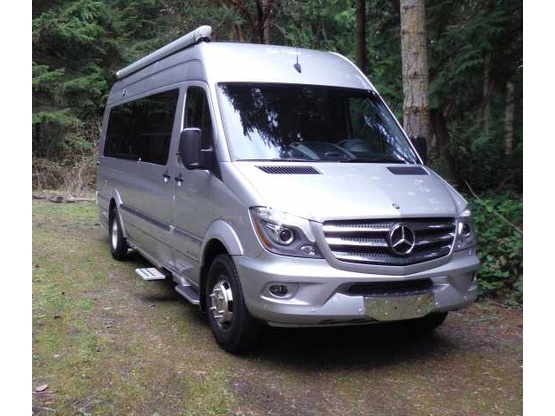 2014.5 (yes, they made a half year model upgrade) Airstream Interstate. Yes, Airstream actually makes a self-propelled model! I got it in March of 2014 and as of March 2017 I have over 60,000 miles on it. My goal is to see those amazing places that I have never seen, and find some of those neat places that aren't so well known along the way. So far I have checked Little Big Horn, Devil's Tower, Crazy Horse, and Yellowstone Park (where we even saw a mama bear and her cubs) off the list! Crater Lake, Yosemite, the Redwood Forest (multiple times), Death Valley (in June no less...) and Joshua Tree park. The list continues to grow. I call my rig the StormRunner, in honor of my dog, Storm. Though, I am wondering if that was a poor choice, since in the first 3 months my travels took me through a wind/dust storm with 50 mph winds, and dust so thick that it disabled most of my sensors (the dash was going crazy), and a thunder/lightning/hail storm, again with 50 mph winds, at least this one was in a place where I could pull over and get under an overpass. Storm does not travel with me these days. We enjoyed hosting StormRunner and the lively conversations that ensued. We'd be happy to see her again, as our driveway guest or as our host, should we find ourselves in her part of the American West. Here is a wonderful lady that brought me ice cream since I broke my ankle and can't get to the store. She was very interesting and compassionate. She has some great tales to tell. She is on her way down the road and hope she'll be back for another visit one day. She is always welcome. And I should be finished up with Physical therapy and back out on the road. Highly recommend Wendy, what a cool person! Will have Wendy back anytime. Thanks Wendy for the visit and soon-to-be Ocean Shores landing spot. Had Wendy and her gorgeous dog, Storm, spend the night at our place. They were both perfect guests!! Really enjoyed meeting Wendy and we had a great visit. Storm is friendly and well-behaved. They're both welcome back anytime they're in our area - we'd love to have them again! This is a wonderful spot so close to the ocean you can hear the waves. And the sunset! Spectacular! All this and a very welcoming host - a perfect visit. I loved parking here. The lot was very private, yet was close to the beach. Wendy was very informative and I'd stay here again in a hot second. Thanks again Wendy!! I had to opportunity to visit StormRunner last week in route to the Glacier Watertown Ham Fest at East Glacier, Montana. I met one of the guests staying for a few days and they were very please at the accommodations Very nice area and excellent access to Glacier National Park. I will be staying as a guest in the near future. We had planned to stay at Wendy's during the Ocean Shores Irish Festival this week. Unfortunately, we were unable to make it. Wendy was super cooperative and was always very quick to respond to my correspondence with her. We are disappointed that our plans didn't pan out the way we wanted them to this week, but look forward to meeting her in person soon. All the Best to Wendy!